In sending forth this work to the public, I am impelled thereto by my desire to benefit the masses of mankind in a manner which I believe they very much need. Man's knowledge of himself seems not to have kept pace with the knowledge of his surroundings. 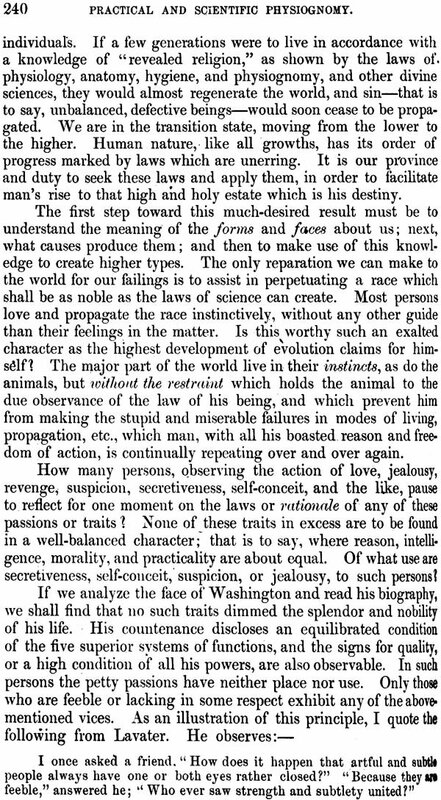 It is time, therefore, that there should be an accordance of intelligence between the two, in order that, through man's comprehension of his powers and possibilities, he may by scientific methods assist in improving his own life and in perpetuating a race which shall be an improvement on the present one. 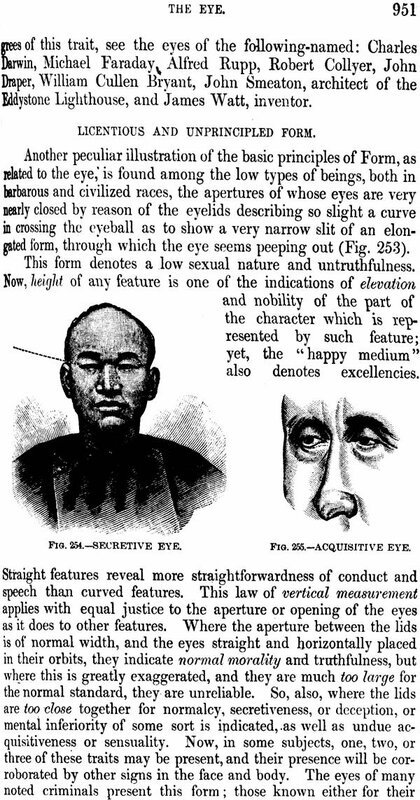 This can come only through a knowledge of anatomy, physiology, physiognomy, and hygienic law, practically applied. I have endeavored to put this science in as plain and simple language as possible, in order that the non-scientific reader may not be confused by an ambiguous terminology. 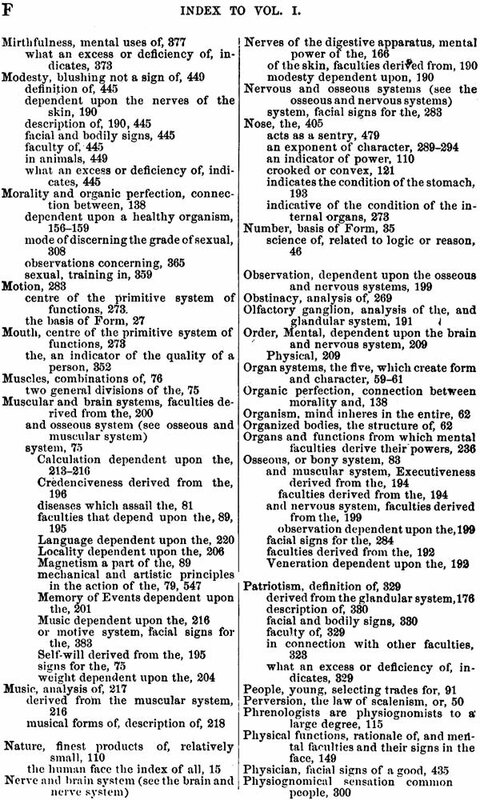 The method of classification used in this system of science is in accord with that observed by all naturalists in their classifications of the lower animals, and is based on the forms of the human organism, which are produced by the intermingling of the vegetative, the thoracic, the muscular, the osseous, and brain and nerve systems. 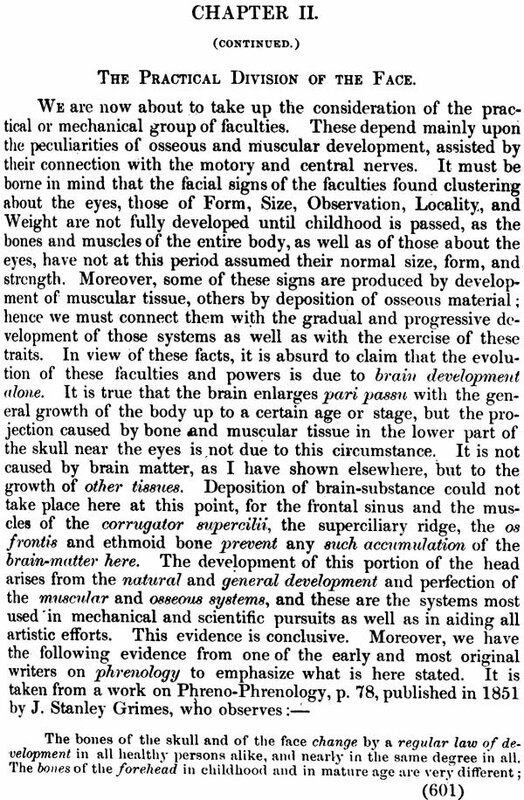 These are treated in the order of evolution, - from the first evolved to the latest acquired, the true and perfected cerebral system. 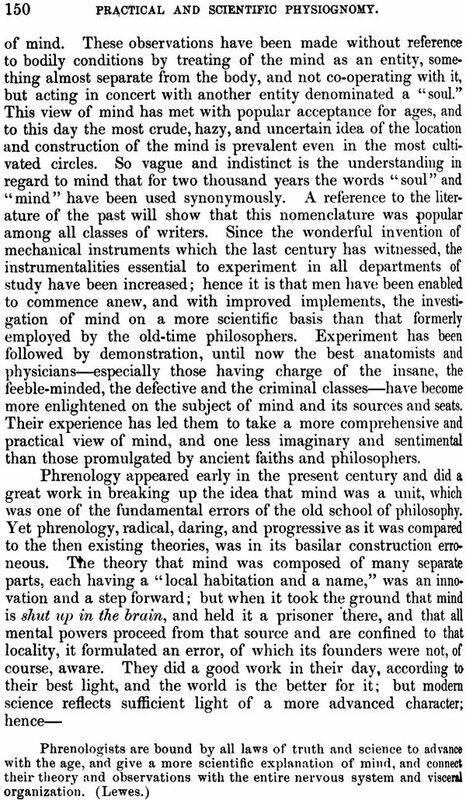 Practical and scientific physiognomy gives the most comprehensive theory of mind of any work hitherto presented to the world. 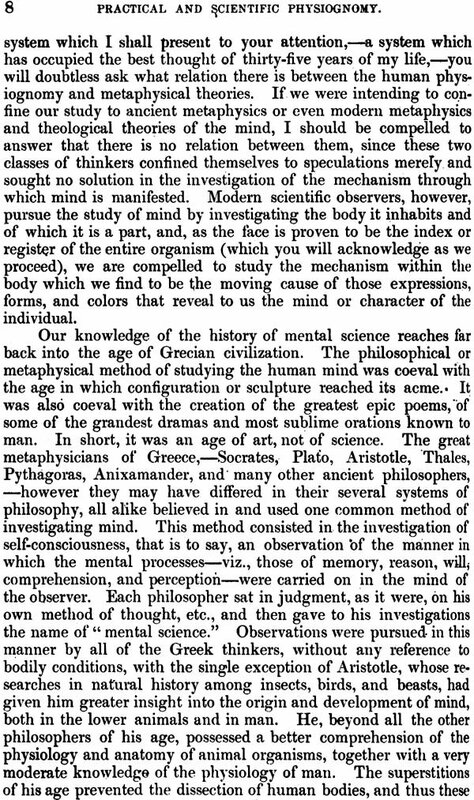 It takes the position that mind inheres in the entire organism, and that the brain is only one source of the mind or of mental operations; that the mind and body are one and indivisible, and cannot be judged as separate entities; that the mind is not shut up in the skull, as is taught by a certain class of metaphysicians.-It teaches that the office of' the mind is three fold, viz., to produce (1) sensation, (2) consciousness, and (3) ideation. 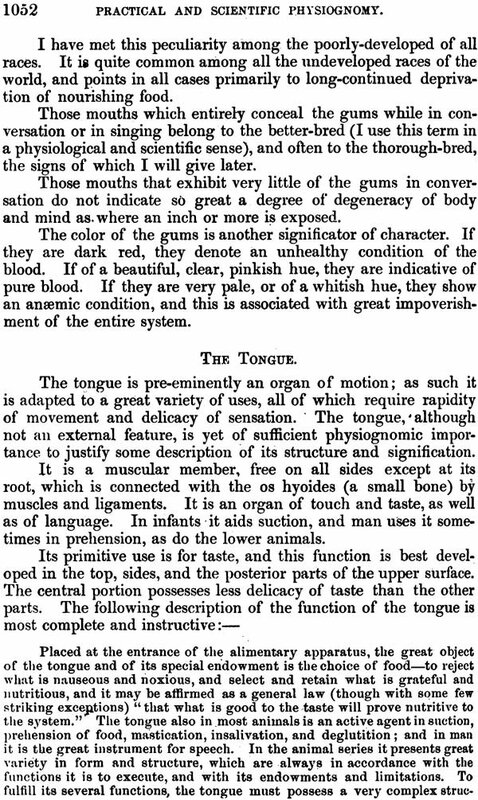 The chief organ of sensation is the outer skin- covering, and this, as well as the " five senses," the visceral organs, together with the bones and muscles, contribute their share of sensation, while the afferent and efferent nerves assist in conveying intelligence to and from the brain, where all sensation is, as George Henry Lewes expresses it, "in some profoundly mysterious manner elaborated into ideas." 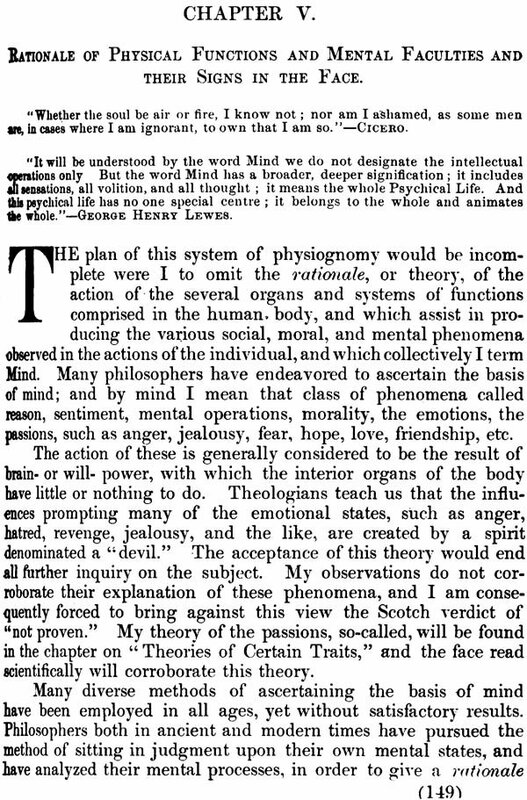 This view of the diffusive locale of mind is supported by Alexander Bain, Henry Maudsley, M.D., Prof. Ernst Haeckel, J. Lauder Lindsay, Herbert Spencer, Rudolph Virchow, Albert Ferrier, and all of the most advanced students of mind and body. 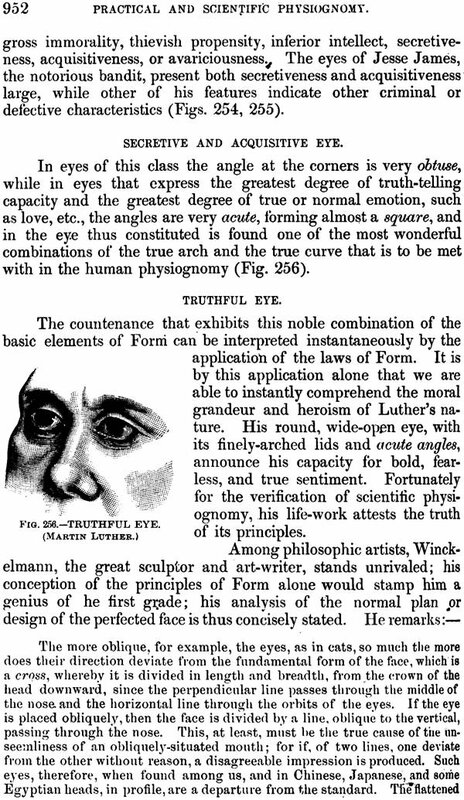 In this system of physiognomy this comprehensive theory has been elaborated and carried to its ultimate by proofs which I believe to be incontrovertible. 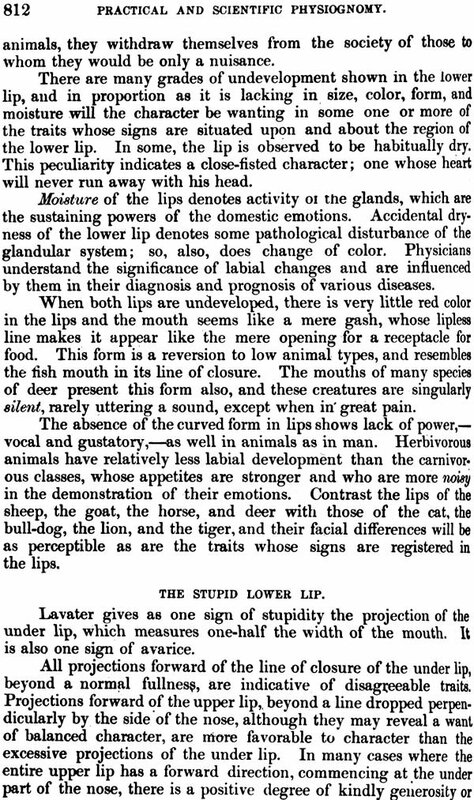 The discoveries in this system of physiognomy include many important subjects. 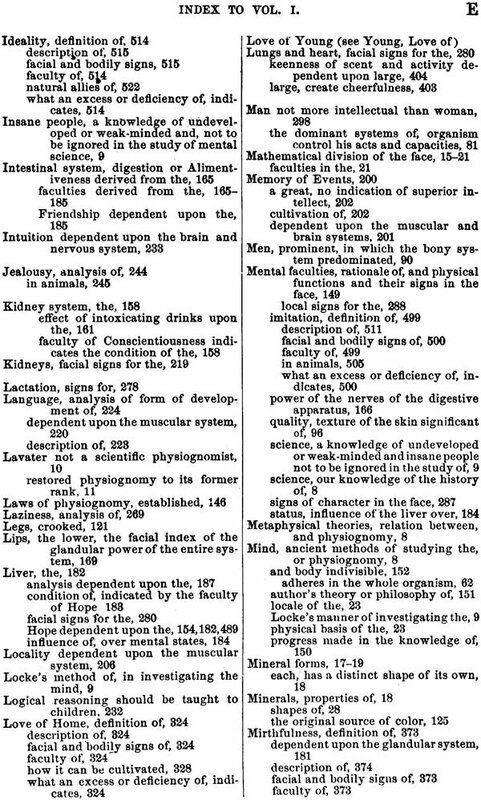 Among them may be mentioned the very comprehensive one shown in Fig. 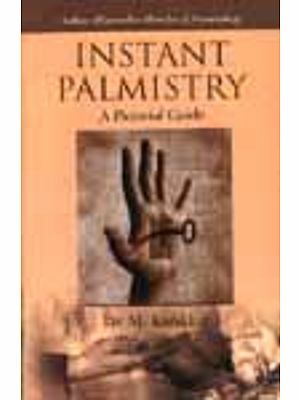 1, which illustrates the three ruling principles in Nature. 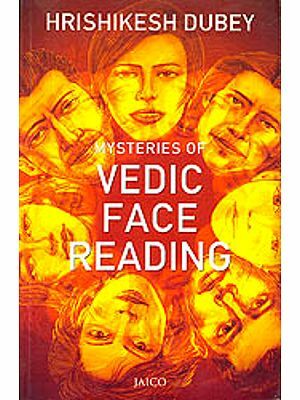 Another great discovery is the localizing of fifty mental signs of character in the face; another is the localizing of the facial signs of all the internal organs; still another, the relating of every mental faculty to a certain physical organ or system of functions. 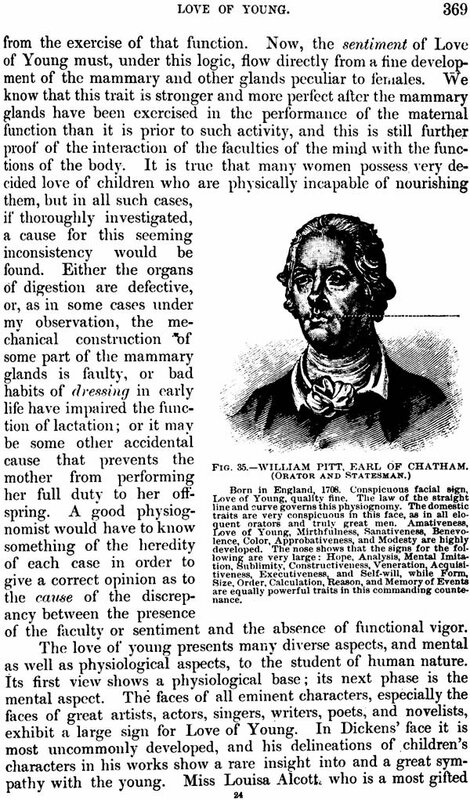 These ideas are all entirely original, and are approved by many able anatomists. 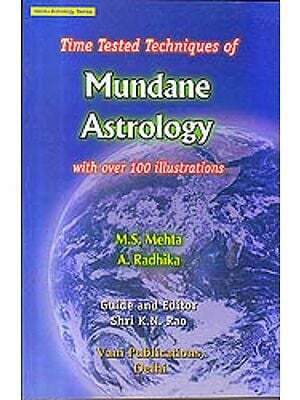 They are extensively figured, and the theories expounding them thoroughly elaborated. 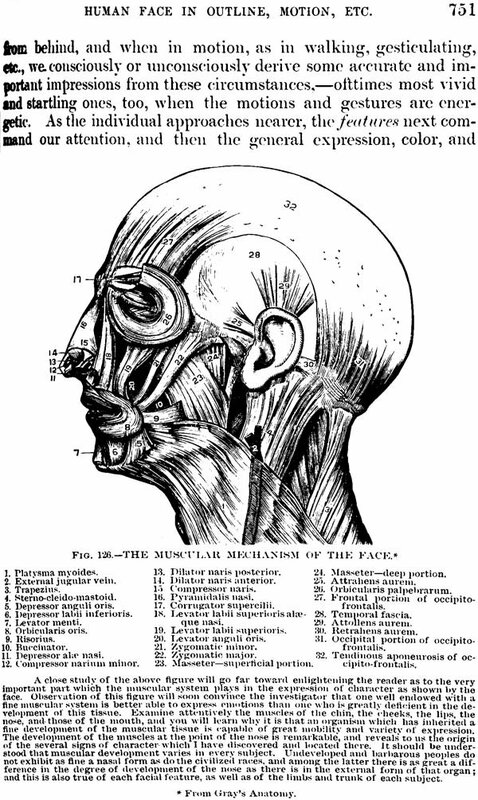 Furthermore, the relation between physical functions and mental faculties is conclusively proven, and each mental faculty is traced to its physiological or anatomical base, either in the nervous, the muscular, the osseous, the thoracic, or the-vegetative systems. 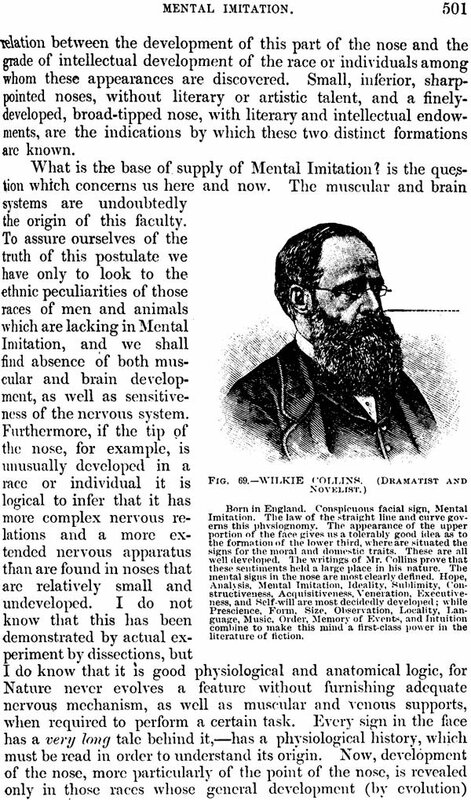 The proofs of the positions which are here offered enable me to lay claim to having formulated the most advanced system of mental science hitherto presented to the public, inasmuch as it traces the several mental faculties to their origin and proves their existence in each case, and locates the accompanying mental and functional signs in the face. 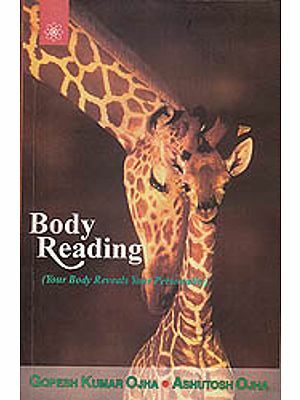 Its practicability is such that children can be taught the sub-basic principles, as well as its methods of localizing the signs of character in the face and body. 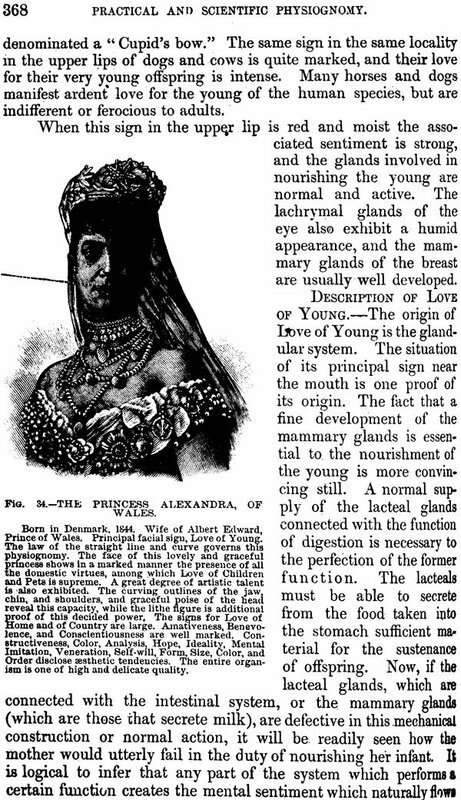 Scientific and practical physiognomy should be a part of the school education of youth, and if life and health are spared me I purpose writing a primary work for the use of young children in the school and family. 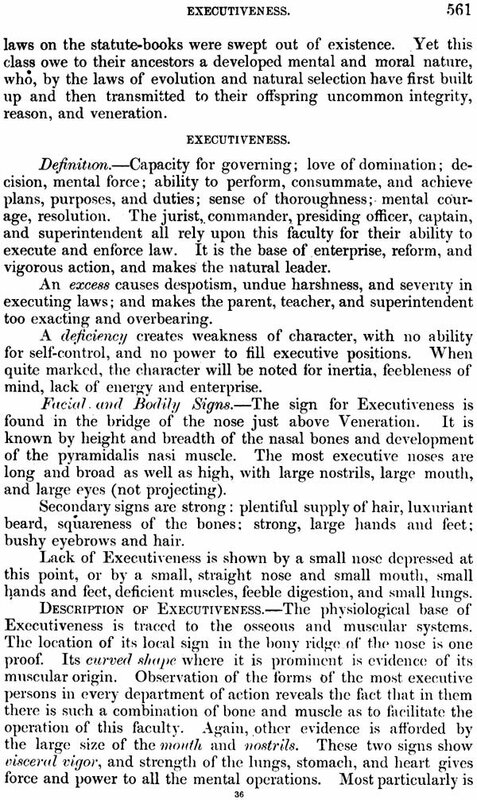 The study of physiognomy commenced in childhood and its principles applied in adult life would advance the mental, moral, and physical conditions of humanity, and carry forward the evolution of the race on the basis of selected types, instead of by the slow, unsatisfactory, and animal-like methods at present employed, in which instinct and not reason governs the reproduction of the human family. 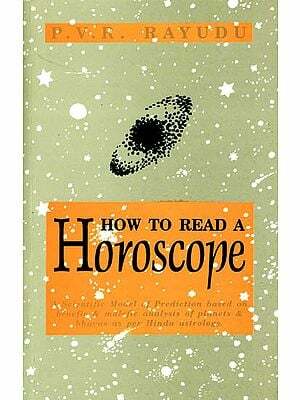 The majority of mankind use their reason in reproduction only when it is desired to obtain a finer breed of fowls or horses. 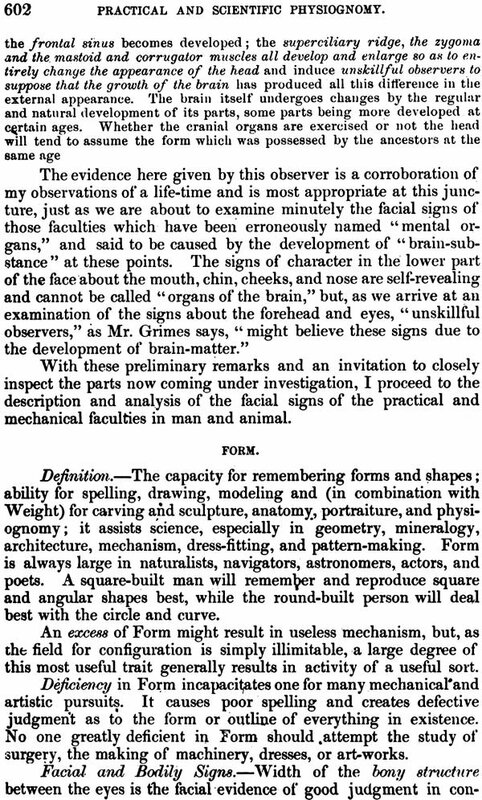 I am fully persuaded that a knowledge of scientific and practical physiognomy, practically applied, will give almost any type of character that is desired, and this is its highest mission. 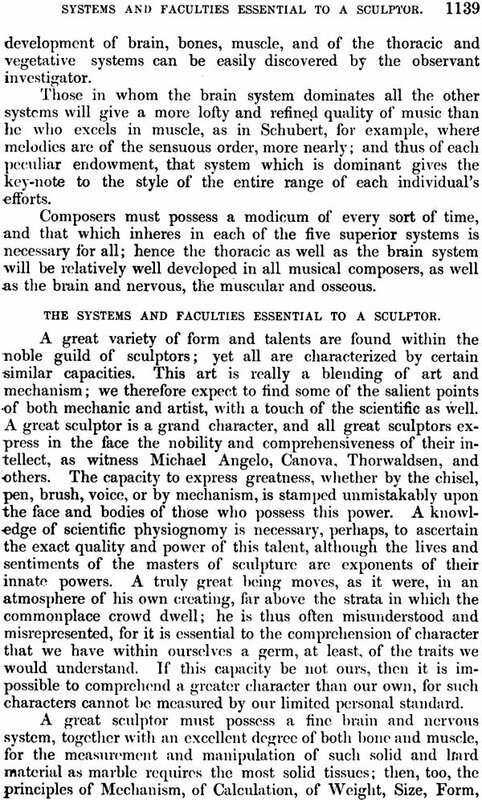 Considerable repetition of the same ideas was unavoidable, owing to the complex nature of' the elements, features, and faculties under consideration. 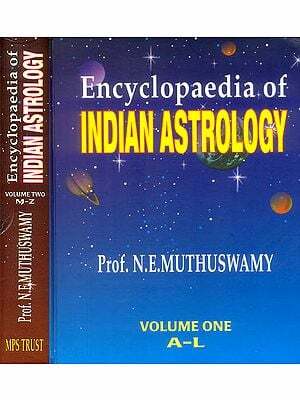 The nomenclature used in designating the faculties is the same in ordinary use by the people at large, and is therefore retained, although no single word can express the scope of a faculty in its entirety. 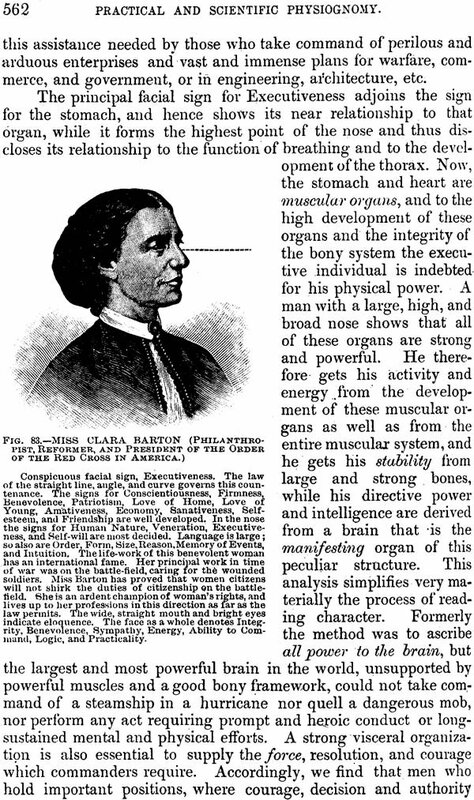 This system takes into consideration every feature of the human body. 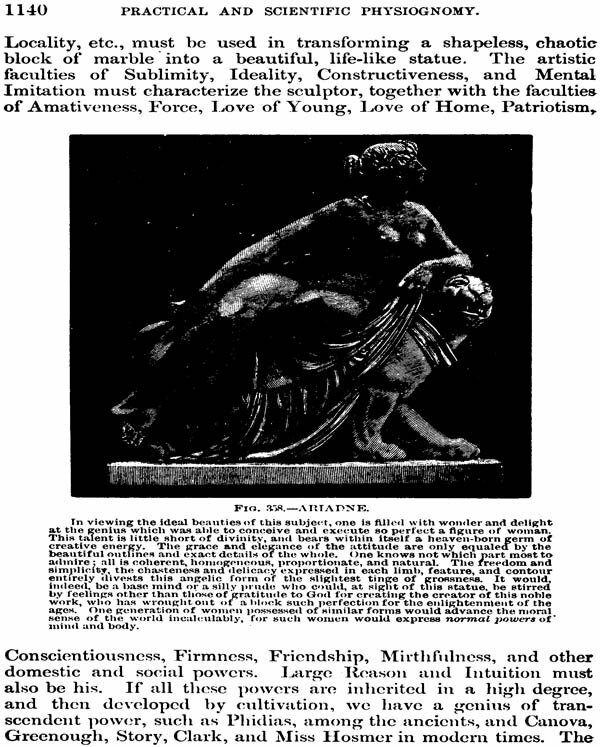 It includes the investigation not only of facial features and signs of character in the face, the body, and limbs, but declares that the outlines and proportions of the form, the colors of the skin, eyes, and hair, as well as the voice, the attitude, the gestures, the movements, the wrinkles, dimples, lines, hands, feet, and muscles in action, are all faithful indices of' character. 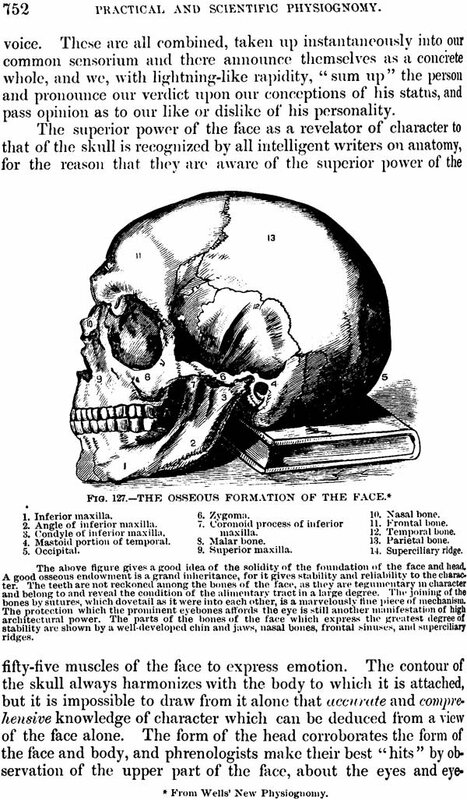 One of the advantages which this physiognomy possesses over all others is that it is a complete system-not scraps, fragments, and compilations from other works on the subject; furthermore, it is not mingled with phrenological, theological, or psychological theories. 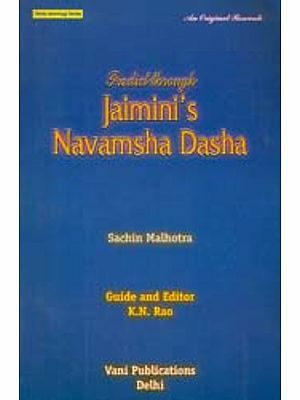 It deals entirely with the material mind in a material body. Speculations in regard to the soul, the, hereafter, as well as to sectarian creeds, are not considered in this connection. 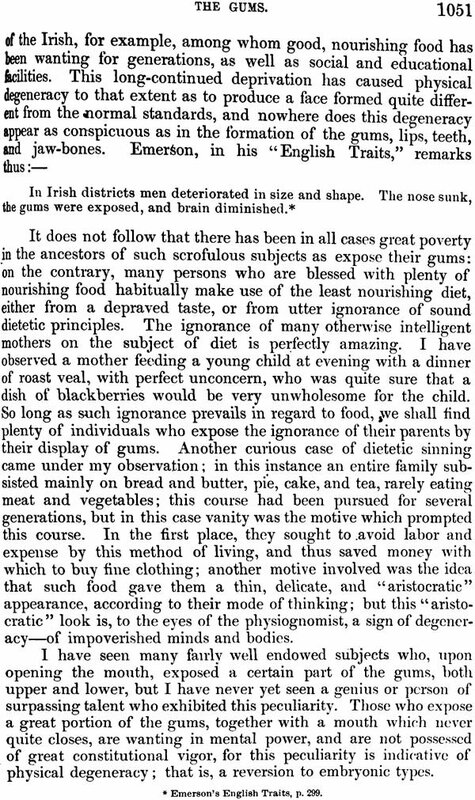 Such subjects I think should be left to their own proper teachers, for I deem it as inappropriate to mingle these subjects with physiognomy as it would be to associate algebra and theology. 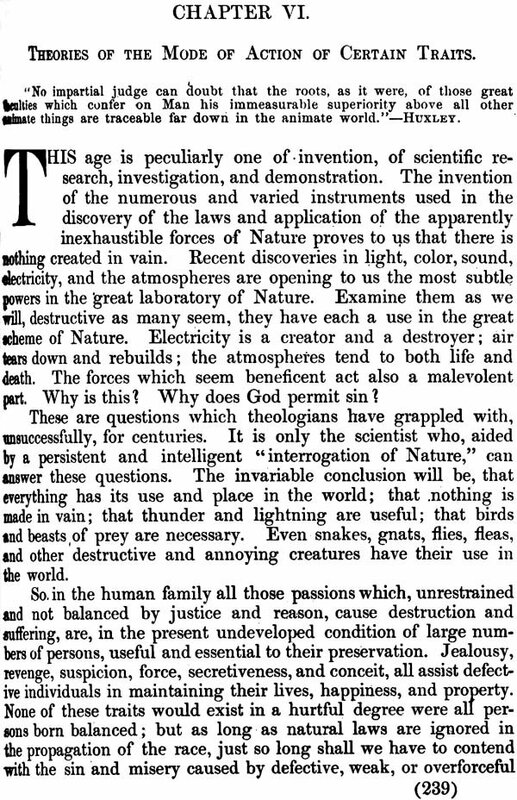 Earnest and religious regard for the welfare of mankind has impelled the writing of these ideas. I have endeavored to treat the subject in a reverent spirit, believing that the study of' God's highest manifestation of creative energy is a subject which should excite our holiest aspiration. Faculties Derived Form The Different System. Chapter 5 Choice of Vocation.